If you’re travelling to Cebu and are looking for an affordable place to stay, then you might as well try Oftana Suites on A.S. Fortuna Street. The hotel, which is located in the heart of Mandaue City, Cebu, offers spacious accommodations without hurting your budget. Oftana Suites has twenty-four fully air conditioned rooms. There are four different room choices available, specifically Standard Twin, Standard Matrimonial, Deluxe, and Family. Each of these rooms are furnished with cable television, NDD/IDD telephone, hot/cold showers, refrigerators, complimentary toiletries. All accommodations come with free Wi-Fi access. Standard Twin rooms have two twin beds and can accommodate two people. This room type costs Php1,300 per night. 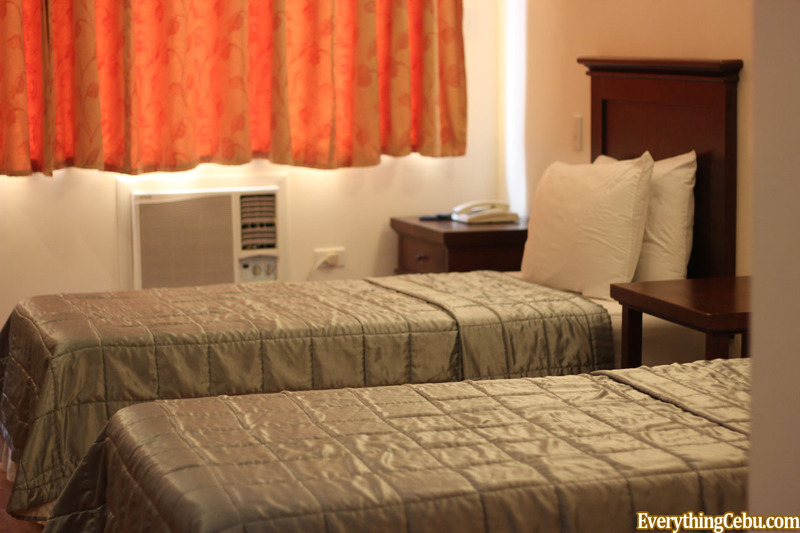 The Standard Matrimonial rooms, which are priced at Php1,400, has a queen bed and can accommodate two people. The Deluxe rooms have a queen bed and a dining area. These rooms can accommodate two people for Php1,700. The Family room has one queen bed and one twin bed, and it can accommodate five people for only Php3,000. The hotel does not charge additional fees for children 12 years old and below if they are sharing the room with adults. However, extra beds are available for Php600 per person. These rates are subject to change without notice. Oftana also has monthly rates. They can offer discounted rates for long-term guests. Simply e-mail them at [email protected] to inquire about your preferred accommodation. Check in time for those staying at Oftana Suites is 2 p.m. while check out time is 12 noon. The hotel accepts all major credit cards. Oftana Suites also has two function rooms that are spacious enough to host meetings, conferences and personal events. There are varying catering options for these function rooms, which can be custom-made in order to work with each individual budget. If you wish to book an event, you can call the hotel to inquire about their corporate packages. Other hotel features and amenities include room service, laundry and pressing service, and massage service. For your safety and security, Oftana has automatic fire alarms and smoke detectors, twenty-four hour security guards and CCTV surveillance. For those who will be bringing their own vehicles, the property has ample on-site parking. For added convenience, adjoining the lobby area is Gold’n Fresh Café & Bakeshop. It is a full service bakery that serves a variety of Filipino breads, specialty cakes, and other dessert items. The cafe also has daily meal offerings and an a la carte menu. It is open from 6 a.m. to 10 p.m. daily. A look at Gold’n Fresh Café & Bakeshop’s Facebook account would reveal albums of delicious treats that await interested diners. Its delectable food choices include whole cakes for only Php400 with a variety of interesting flavors, such as Choco Fudge, Black Forest, Choco Delice, and Rocky Road. They also have mini cakes, starting at Php55 each. You can choose from mini apple cakes with apple cream filling, root beer chocolate mini bundt cake, or mini chocolate bundt cake filled with a chantilly cream. Their carrot cake with cream cheese frosting also comes in solo size and is priced at Php65 apiece. Gold’n Fresh Café & Bakeshop’s custom-made desserts include caramel brownies, mango blondies, Dutch apple pies, cookies & cream cupcakes, and chocolate chip cranberry scones. Other sweets include chocolate fudge roll, cream puffs, torta, bibingka, banana caramel tarts, chocolate temptation, and blueberry cheesecake. If you’re in Cebu for a vacation and your itinerary includes the white sand beaches of Mactan, then you don’t have to worry about travelling as the hotel is just twenty minutes away from these world renowned beaches. If you’re more interested in heritage and culture, then you have nothing to worry about. Simply hail a cab or ride on a jeepney to visit the heritage sites located in the downtown area of Cebu City. Among the sites you should visit are the Yap-Sandiego ancestral house, Casa Gorordo, Magellan’s Cross, Basilica del Santo Niño, the Cathedral Museum of Cebu beside the Cebu Metropolitan Cathedral, Plaza Independencia, and Fort San Pedro. The hotel and the café are easy to locate. There are public utility jeepneys that regularly ply the A.S. Fortuna St. route. If you’re coming in from the Mactan International Airport, Oftana is approximately a fifteen-minute drive. For more information on Oftana Suites, you can send them an e-mail at [email protected] or you may also give them a call at (032)421-3471 or (032)238-4600. You may also visit the hotel’s Web site at www.oftanasuites.com and their Facebook account at www.facebook.com/oftanasuites. For more information on Gold’n Fresh Café & Bakeshop, you can call them at (032)416-2061 or find them online at www.facebook.com/GoldnFreshCafeBakeshop. ` Nice hotel to stay with for those people who are seeking a cheap ones .. It has a nice facilities, and Wifi. These would be a great place to stay with to those people who wish to check-in accompanied by their children, for there’s no additional pay :), sounds great! Thanks for this info ^_^ .. Informative and useful to us. You may wanna try also this site http://www.mcitisuitescebu.com/, it may help you.. Thanks!